The Long Drive-In Theatre combines the best of everything. Great movies, beautiful nights, and a full service restaurant. Check out the web site for what's playing but they are more than just movies, review their upcoming events too. Attraction Address: 11260 Hudson Blvd. 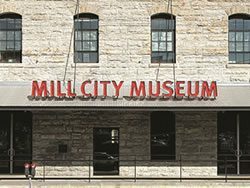 N.
Attraction Introduction: Flour milling may not sound like an exciting concept, but Minneapolis was built on flour and the Mill City Museum provides a portal to the city’s storied past. The museum lives in the partially reconstructed ruins of a flour mill that exploded in 1878, burned in 1928 and burned again 1991. You can still see the twisted girders that melted in the heat and the soot on the bricks, but this relic from Minneapolis’ history is still standing. Billed as “the best-smelling museum ever created,” a bakery operates in the museum’s basement. Visitors can smell the fabulous aromas of the Baking Lab while they peruse artifacts of the city’s milling days. They can learn all about Minneapolis, from then to now, in the film, “Minneapolis in 19 Minutes Flat,” which plays in the museum’s small theater all day long. Afterwards, visitors can head up to the Flour Tower, an elevator ride that shows how milling makes wheat into flour (and why it’s explosive!) and culminates in a rooftop deck with a panoramic view of the entire Mississippi Riverfront, including St. Anthony Falls and the Stone Arch Bridge. Attraction Address: 704 South 2nd St.